Back of the Cereal Box: Balls! A new twist on an old favorite: "Ha ha — This species' name." 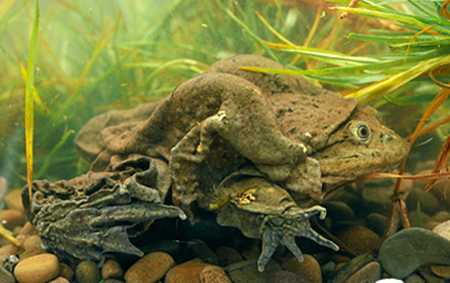 This week, the Ever So Strange Animal Almanac introduced me to the Lake Titicaca Frog (scientific name: Telmatobius culeus, sometimes, perhaps erroneously spelled Telmatobius coleus), a strange species whose folds of skin give it the appearance of a wrinkly leather bag. It should be no surprise, then, that its species name translates from Latin as "testicle." By extension, the term also refers to the whole scrotum, and that's exactly the organ scientists had in mind when they named this South American marvel. It's an understandable association. See? The Latin slang coleus (the oh-so-necessary plural being colei) comes from obscure origins, though Cicieo's use of it might have been in reference to a wineskin. Regardless, it's the non-technical but not-exactly-vulgar term for every man's pair of swingers. Coleus is also the word from which the Spanish term cojones descends. (Ha ha, "descended balls.") A word mystery: Coleus also happens to be the name of an Old World genus of perennials. What's so ballsy about them? No idea. But don't think that this frog — a critically endangered species, mind you — is a hopping, swimming joke. If we want to respect it, we should just refer to it by its common English name, Lake Titicaca Frog, Titicaca of course being a South American term that translates to English as "tittyshit."